Ruben Hayrapetian, the head of the Football Federation of Armenia (FFA), suspects that a “betrayal” took place during the October match in Yerevan between Armenia and Albania that ended in the visitors’ victory. The 0-3 defeat that allowed Albania to qualify for the Euro-2016 finals – for the first time in the history of the nation – marked an inglorious end of the season for the Armenian team that was heavily criticized for underperforming. Soon after the game some Serbian media alleged “match-fixing”, but no solid evidence emerged immediately to implicate any of the Armenian players in “foul play”. Talking to media on Wednesday, Hayrapetyan, who has been under a barrage of criticism over the team’s poor performance lately, stated that he also believed that “a betrayal took place during the match”. 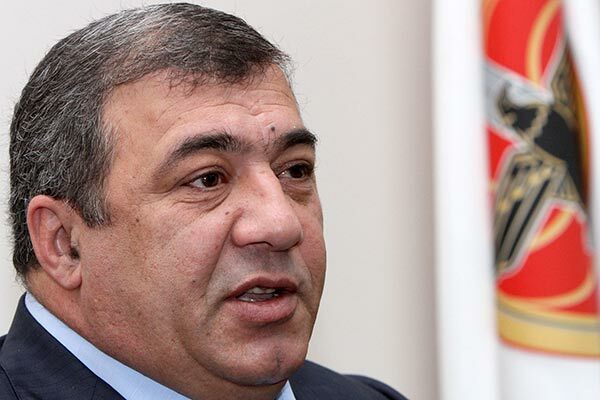 Hayrapetyan did not name names, but said he was determined to deal with the situation and uproot any corrupt practices that may exist in the national team. “The national team belongs to the entire nation. It is appropriate that everyone should be dissatisfied. As president of the federation I am going to do everything to overcome this crisis,” the FFA pledged. “Our national team players simply do not want to play. As for the match against Albania, there was a betrayal during it. If even the best coach had headed our team during the match against Albania, the result would have been the same,” Hayrapetyan said. At the same time, the FFA head dismissed calls from some fans for his resignation, saying that he would never yield to “ultimatums”. Scores of fans representing the First Armenian Front (FAF), a local fan club set up in support of the national team, held a series of protests near the FFA headquarters earlier this month, demanding that Hayrapetyan meet their demands concerning the state of soccer affairs in Armenia or quit the job. Among the main demands of the FAF are as follows: to invite a highly qualified coach, to reconsider the practice of not inviting players to the team because of conflicts and lower the prices of tickets to the home games of the national team.